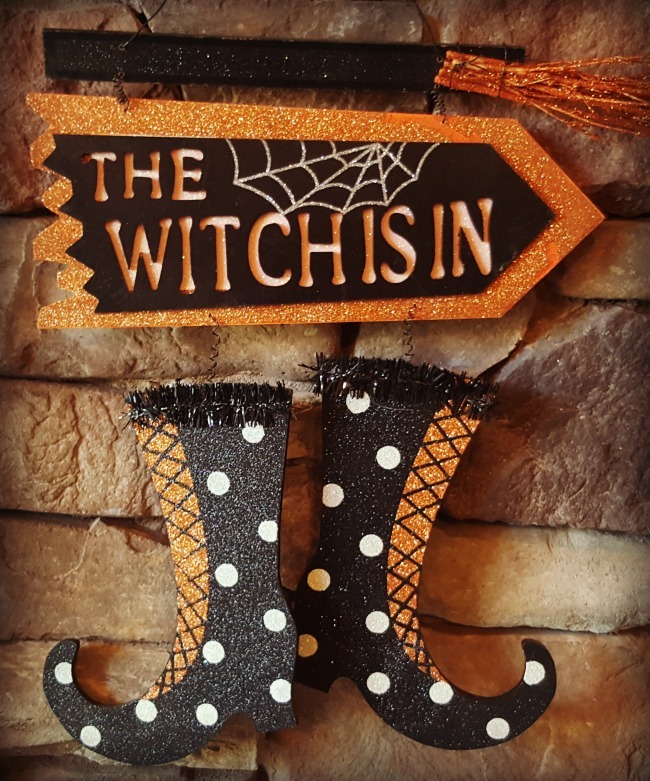 Home / bloghop / Halloween / tablescape / Witch / The Witch Is in! 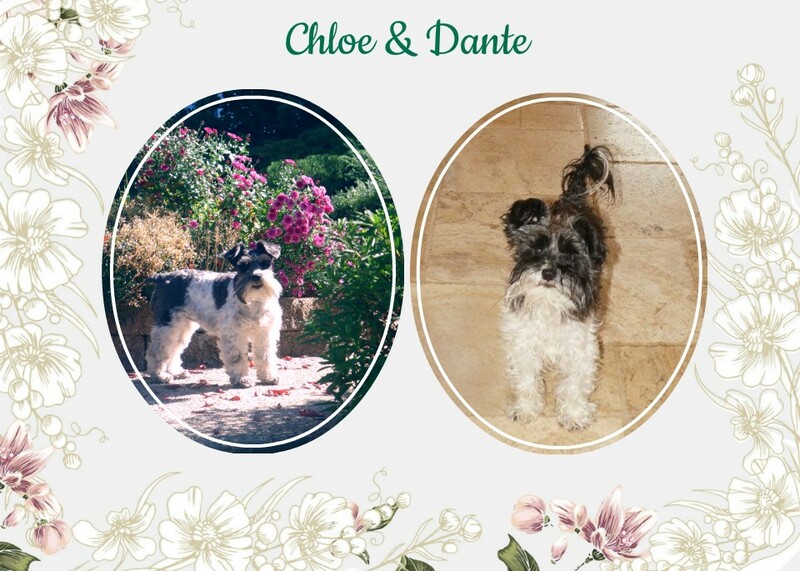 Hello everyone, I am participating in another blog hop, organized by Chloe from Celebrate and Decorate. Creating a Halloween table is always fun. It's great to see how creative everyone is. 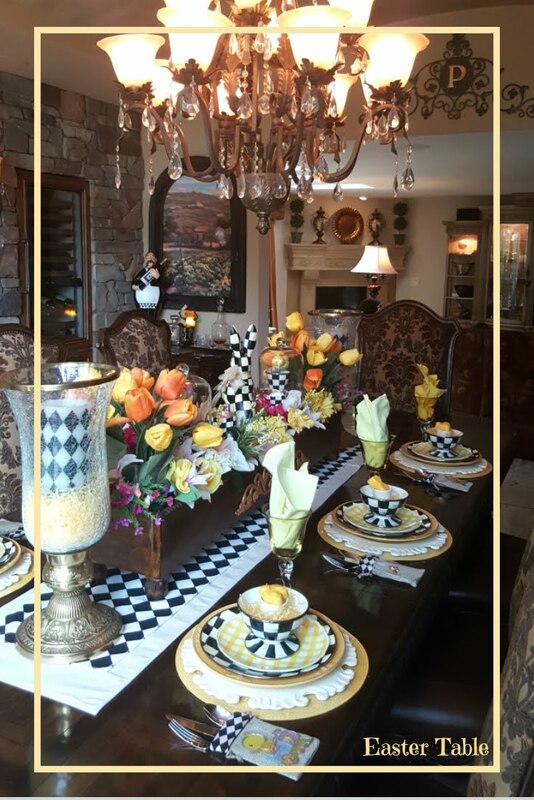 The table is mostly Mackenzie Childs inspired. Using the Courtly Check pattern is fun and unique. My new additions this year is the tall vase and ice cream bowls. Most of the plates are from Grandin Road. I bought them years ago. Black flatware complete the look for this witchy table. The black goblets are tall and elegant. They were purchased from ZGallerie years ago. The jeweled spiders are from our local Pottery World. Creepy witch fingers for the candle holder fit within the theme. I found them for a bargain at our local Ross store. The Harlequin candles are battery operated. I love using candles that use batteries. They are a Grandin Road purchase. They are pretty cool and so safe! I am using one of my witches. I have about four that I like to use for Halloween. I have had them sitting on the mantel or all of them sitting at a table for a witch convention. One of the plates from Grandin Road is this cute owl plate. 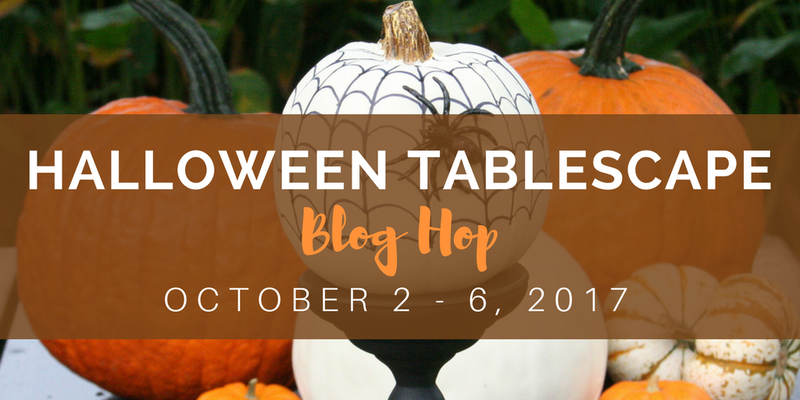 Thank you Chloe at Celebrate and Decorate for putting together a Halloween blog hop of tablescape ideas for everyone to enjoy! Be sure to visit each blog on their day for a new post with fun for Halloween. I’m joining the Hauntingly Beautiful Decor Halloween Link Party and you can too! Sharing at some of these parties. just awesome!! 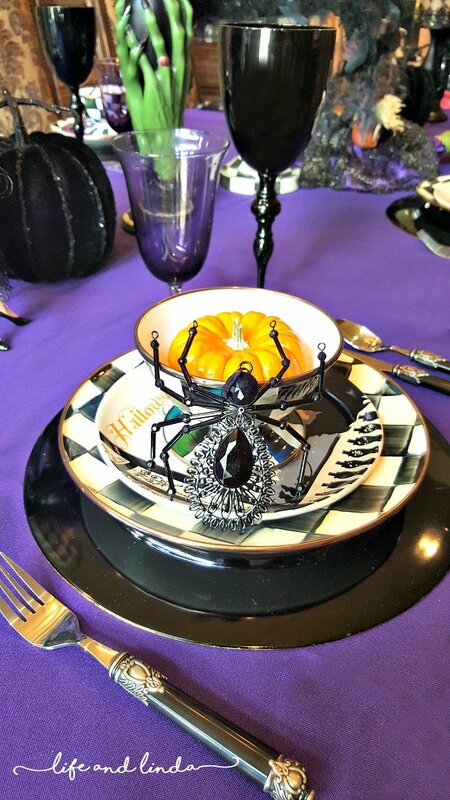 I love the spider.. that looks so beautiful..
What a fun witchy table, Linda. The black and white with the deep purple really sets the stage. Great job! Such a fun table, Linda. And I love your witch. I hope she flies on her broom when the moon is full. Always FUN here always.Joie de vivre. 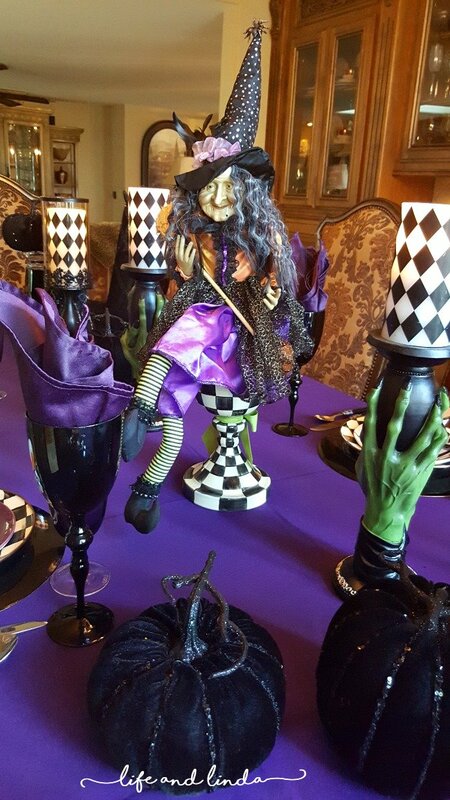 Great table setting, I especially like the witch! Linda, you're so snazzy! That witch is adorable. Oh my Goodness!! Those witch finger candle holders are the best!!! I love those!! They look fabulous with the harlequin candles - and of course your MC dishes. Your deep purple table cloth makes the perfect backdrop. 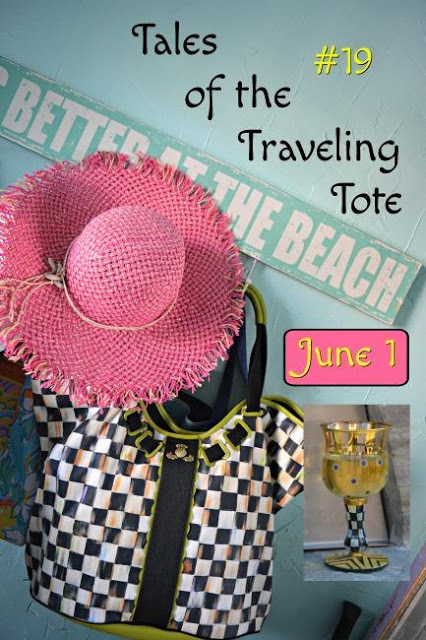 I am so enjoying this blog hop! Your witch is wonderful Linda, she really sets the scene for an eerie experience, and the jeweled spiders are fabulous! Of course I love all your MKC! Total fun, happy hop day! 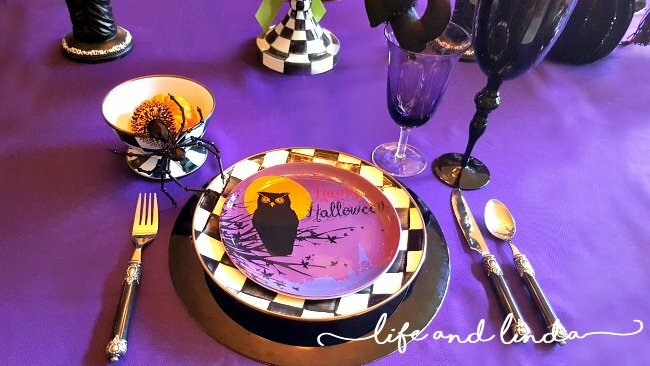 I love the purple base for your tablescape, great Halloween dishes too! You have a truly spooky table, so fun!! 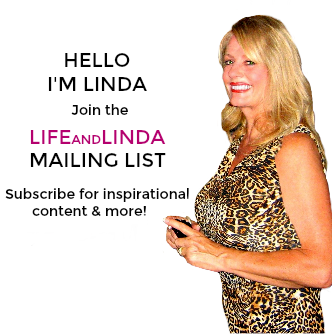 Hi Linda, wow how fun! I love your table you decorated. The black and purple theme are really cool along with the witch! WOW.I love what you did. The witch is really cute. 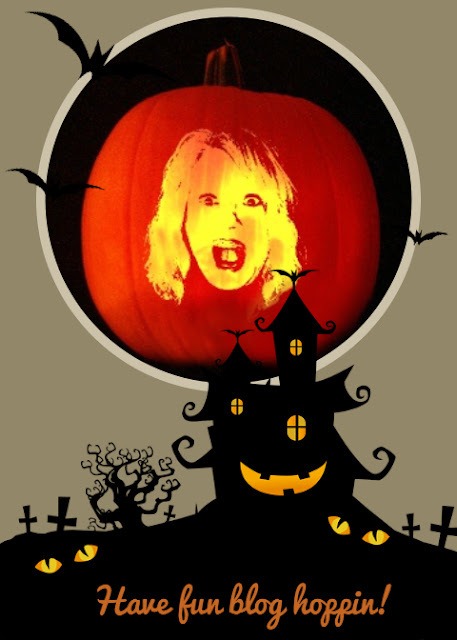 Spooktacular Linda! I'm lovin' the purple inspired by your witch and isn't she so lucky to have a Courtly Check vase (or cauldron) to perch on! Wonderful plates and the harlequin candles are bewitching too. All the guest witches will love coming to your table, Linda! I love the harlequin candles and your new CC pieces. You hostess witch is wonderful! Happy Haunting! So, so, so, so cool! I especially love the candles! I agree 100%...battery operated are so much safer! I use them now about 85% of the time. Awesome Halloween tablescape! Love the purple tablecloth and the candles from Grandinroad. 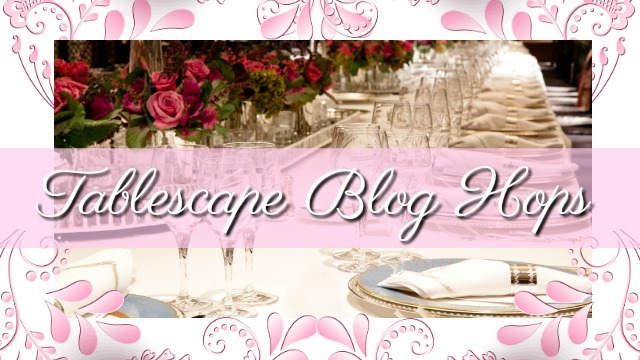 Have fun with the blog hop! Linda, I am loving the purple...it gives Halloween a different look! The plates are so fun. Your witch is the piece de resistance! 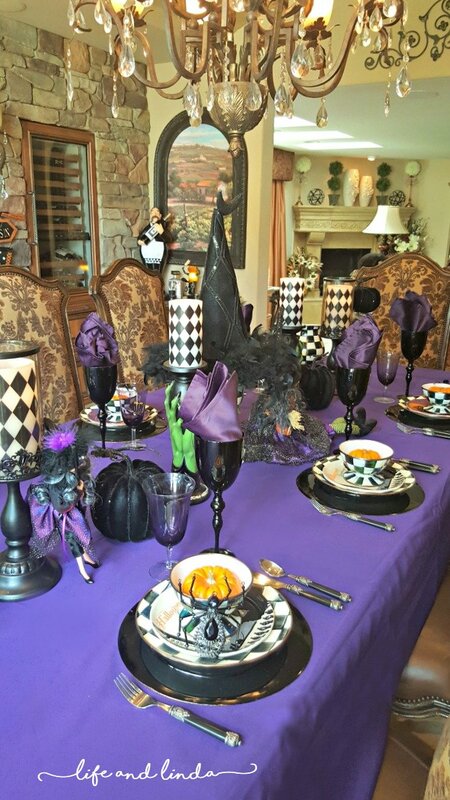 It is a spooky kind of elegant tablesetting! This is spooktacularly beautiful!!! Love the witch hands on the candle stick. The bejeweled spiders are perfect too. Always love your tables and you manage to make Halloween elegant! The black and white! I love it! Oh and those velvet pumpkins!! Linda, your tables are always just beuatiful! I love the purples mixed with the MacKenzie Child's china. That witch is too cute, and those candles are a perfect finishing touch! It is always fun blog hopping with you! Happy Fall!!! Oh, my goodness, I'm not really much of a Halloween person but that table is adorable!! 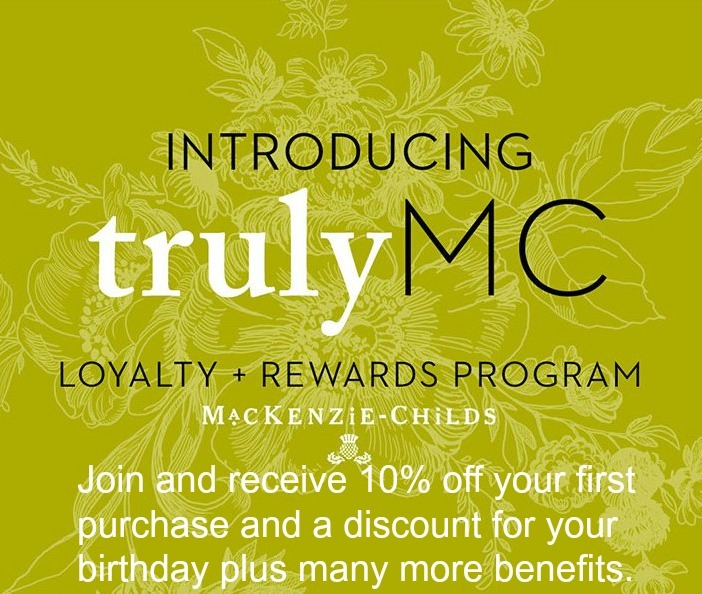 I love McKenzie Childs! Always love seeing your decor! Courtly Check, green, witchy hands, bejeweled spiders, harlequin candles, plush black pumpkins, and the witch herself-- oh, this is fabulous! To sit down at this glorious table would be a delight. Boo-t-ful!!! Loved visiting and playing with you! I just love those candles and witch candle holders. Love this! Excuse me while I pick my jaw up off the floor! This table is absolutely beautiful and I love every bit of it. Love the striking colour combo you used - the purple with black looks wonderful for Halloween. 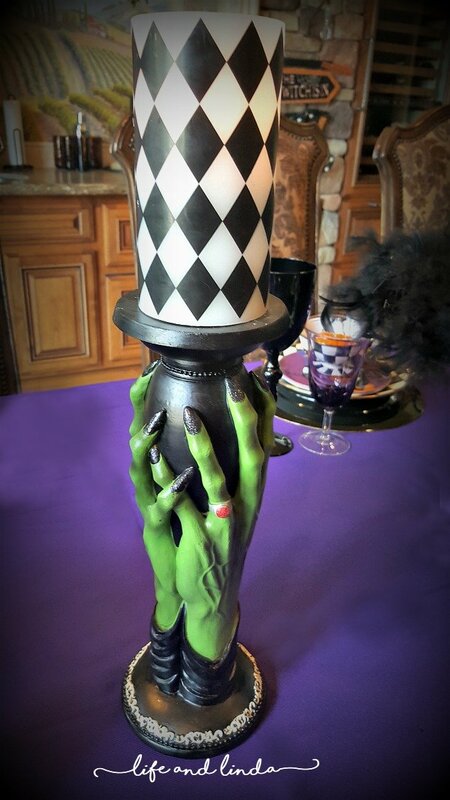 The green-hand candleholders make the perfect accent to your terrific witch centerpiece. 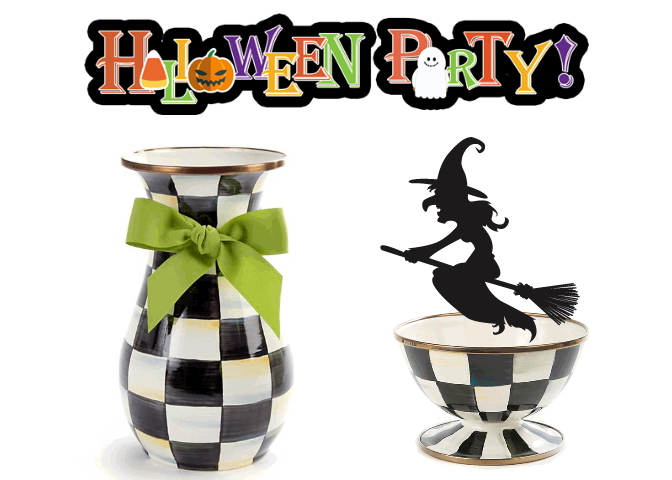 The black/white check of the McKenzie Childs and black handled flatware with the goblets add to the Halloween vibe on your table. Great job! Such a beautiful table! Love all' this purple, is so... "witchy"! What a fun halloween table. Love the green hands candle holders! 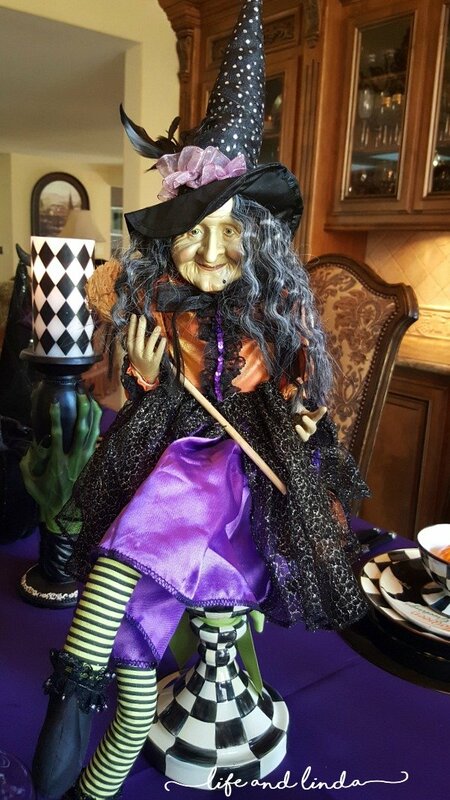 Hi Linda I love your witch and festive Halloween table! We would be delighted if you would come and link up at the Hauntingly Beautiful Decor Halloween Link Party! I am looking forward to seeing more of your posts on your blog! I loved your use of purple for an elegant dinner with Halloween accents (and visitors!). The purple goblets are lovely - and the bejeweled spiders are so unique! Love your table Linda! Those sparkly spiders are great and the candle holder with the creepy green witch hands is absolutely creepy! Thank you so much for being a part of the blog hop and sharing your talent and creativity! You always manage to make even a Halloween table look elegant! 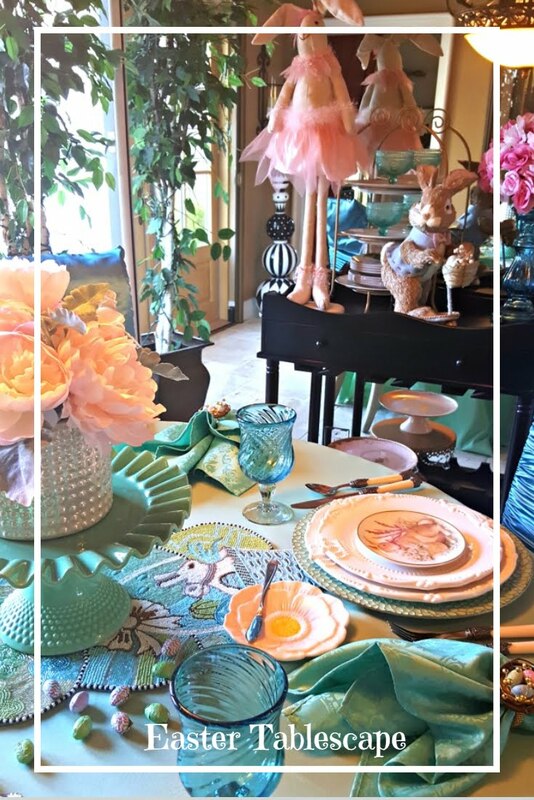 Love your witch and the table is fabulous!